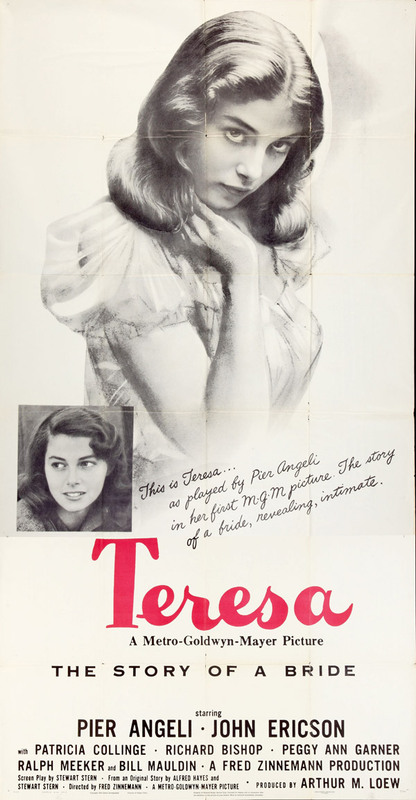 Between filming The Men with Marlon Brando and High Noon with Gary Cooper, the great director Fred Zinneman made an incredibly low key picture called Teresa, now remembered primarily as the film that introduced Anna Maria Pierangeli to American audiences. Set during the war and in the months immediately following, Teresa tells the story of Philip Cass (John Ericson) a baby-faced replacement soldier who gets off on the wrong foot with his platoon, and never manages to find solid ground among the weary G.I.s. Cass’s first taste of combat comes to a terrible conclusion when he panics and fails in his duty. He's shipped back to the aid station in a state of shock, knowing only that his cowardice got one of his fellows killed. Unlike fare produced during the war, Teresa is remarkably kind to Ericson's character — the movie demonstrates that Hollywood and the American public at large were trying to understand and come to grips with the terror of combat and the debilitating affect it could have on combatants. Following VE day Philip is returned to his unit, where he awaits orders to ship home. During that time he meets and falls in love with Teresa (Pier Angeli), a too-young, too-thin, impossibly pretty waif of a girl. The youths are smitten with one another and quickly marry. After a brief wedding trip to Rome, Philip is ordered back to the States. Owing to the legalities of war time marriages, war bride Teresa must wait in Italy for permission to join her husband in New York. By the time it comes, Philip has settled back into his old life — with a smothering, put-upon mother (Patricia Collinge) who keeps him close to her apron and a father who can't stand up for himself — or his son. Philip is so terrified of his mother's reaction to his wedding that he refuses to tell her. She discovers his wedding photograph anyway and collapses in a fit of trumped-up sobs. The stage is set for Teresa's arrival in the city, with predictable dramatic results — high tension between everyone involved. When pregnancy complicates matters further, the situation escalates and then finally resolves itself in true Hollywood fashion. Although this has never been given a home video release, it has aired on TCM — though not for some time. I was able to acquire a homemade copy from the last time it was shown on television. It's due to come up again, and shouldn't be missed when it does. Given the star, studio, and director, it's surprising this isn't more widely available. Availability: Has aired on TCM.